We decided to make a simple Minecraft Creeper fractal for the purposes of this example post, but you should try to think outside the box and consider many different ways of generating a fractal to come up with your own unique design. Your assignment is to create a new fractal model, not to replicate an existing or known fractal design. Be creative, and try to create something truly three-dimensional (not just an extrusion like my simple example below). Talk here about why you chose your design and why think it is a fractal (your Math Consultant should put some thought into this). Also share your design tools and how you created your design in Tinkercad (your Designer should try to be specific). 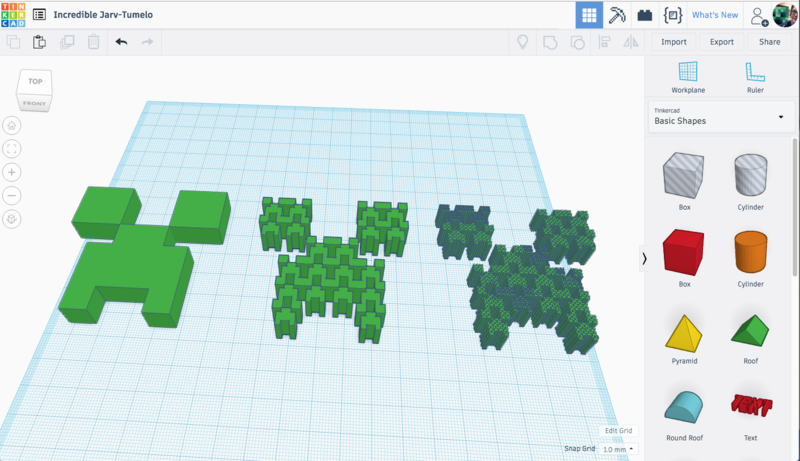 Include a screenshot of your Tinkercad design, and also make that screenshot the Featured Image. You can finish here with any additional thoughts: Will your design be difficult to print? Are you happy with it? What do you think you could change about it to make it better? Is it working the way you expected? In this section you should put a picture of the 3D prints you made of your fractal. Include pictures and descriptions of your failed prints, as well as at least one nice picture of your final print. Here’s where you should put your calculations for the length, area, or volume of various levels of your fractal (0, 1, 2, 3, 4, …, 100, …, n, …, infinity). If we decided that it was too difficult for you to make that calculation for your new fractal, then do the calculation for one of your group members’ “First Fractals”. In either case, a labeled picture or drawing might help illustrate your work. IMPORTANT: Think carefully about how to express your thoughts in this section so that your mathematics is easy to read and understand. You might make a table or use bulletpoints to keep things organized. Remember, this is a math class, so I’m going to grade this section seriously. Can you compute the fractal dimension of your fractal? Why or why not? If we decide it is too difficult to calculate fractal dimension for your fractal, then do so for one of your group members’ “First Fractals” (possibly different than the above). In either case, a labeled picture or drawing might help illustrate your work. IMPORTANT: See same note as for the previous section. You can find a free downloadable copy of our fractal at Thingiverse (include a link). Make sure you’ve filled out description, tags, and photos on the Thingiverse page. Start working within a group, with one Designer, one Math Consultant, and one Writer collaborating and sharing the work. Get more comfortable thinking and writing about mathematics. Learn the basics of Tinkercad and how to use the Tinkercad tools that enable you to create precise/accurate/mathematical models. Start the first iteration of your first serious design project. You can expect that your design will grow and change over time; this post is where you will document those changes, by adding additional sections in future assignments. The first part of this assignment is due before the start of class on Tuesday, 9/17. Additional sections will be due on later dates. Students should work in groups and attempt to split the work equally within their designated group roles. It is up to you how you want to interpret those roles in order to ensure that the work is distributed evenly for all team members. To make the section headers, use “Headers 3” from the Paragraph drop-down menu. To list things without an extra linebreak inbetween, as you should in the “Group members” section at the top, press Shift-Return. Don’t forget to set a Featured Image for your post. Don’t forget to set the Category of your post to “Tinkercad Fractal”.